Today ( Dec 6 ), Jamie Dimon, CEO of JPMorgan, was interviewed on CNBC. He opined that the bond market was in a bubble and he would not buy US bonds ( I think he meant treasuries ). What did he mean by that ? And what does it mean for the bond buying boglehead ? Interest rates too low and don't buy longer-termed bonds, perhaps ? If you wish to profit from his prophecy, sell 10 year Treasury futures. Although you might get added to the road of bones built from every trader who tried to profit from speculation on interest rates or oil prices. A similar bubble is expanding today that may have far more serious consequences for investors. It is in bonds, particularly U.S. Treasury bonds. Notice that in a sense they were right--interest rates rose, within the range they said they were worried about, and the value of the bond fund did dip. Notice, too, that it didn't amount to much compared to the general loft in value provided by the steady interest payments paid out by the bonds in the fund. And the answer is: it means nothing for a bond-buying Bogleheads. Do not act on guru opinions like those of Dimon. Just stay the course. First of all, they don't actually know. Second, without context, you have no idea how much of a problem they are talking about. Maybe he buys long-term bonds as part of some fragile leveraged structure that will come crashing down if there's a 5% decline in bond prices. Maybe he's worried about something that you won't even notice if it does happen. And he might even have ulterior motives. Maybe he's trying to influence the Fed, or the market, to do something that will help JPMorgan. He's not your personal advisor. He hasn't signed a paper saying he'll act as fiduciary and put your interest above his. Finally, whenever a guru says something, you can always find another credible guru who says the opposite. To me it means do not listen to CNBC. You need to learn about these things for yourself. Think about it for a moment. If you buy a 2 year Treasury today, you will recieve about 2.8% interest each year and will get your principal back after the 2 years - come hell of high water. Now what is so bad about that? This is a perfect example of why bonds are so misunderstood. You can’t always be sure what the “experts” mean when they opine about them. Usually it’s about the capital appreciation aspect. But the rest of us look at total returns as well as their importance in balancing the portfolio and generating income. 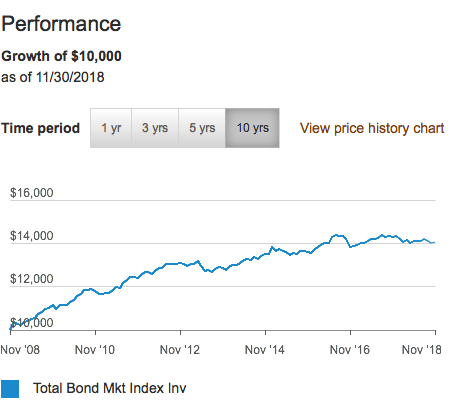 Help - How do you get a growth chart of a bond/fund/stock that includes distributions? Everything I see is always a price chart. If you want to lose everything I strongly suggest you short US long term treasuries. You are going up against a debt monetizing goliath with a printer that has no limits. Use the charts at www.morningstar.com. It means Jamie, JPMorgan, and/or CNBC want you to believe they have a functioning crystal ball. 3) Some brokerages, e.g. Fidelity, show growth charts for many funds--often these are really rebadged Morningstar charts, but it may be a more convenient place to find them. More generally, it means that Jamie Dimon says he is not buying bonds and wants you not to buy them, or to sell them. Which is another way of saying he wants to see lower prices on bonds. Which is another way of saying he wants to see higher yields and higher interest rates. Maybe the Fed. Maybe you. Maybe both. Whose interests is he serving? Surely JPMorgan. Possibly the general good of the nation. By coincidence, your interests might be aligned with his. Or might not. I didn't see the interview, but Bloomberg reported that Jamie Dimon said he wouldn't be a buyer of long-term Treasuries at current levels. With the 10 year at 2.85% and the 30 year at 3.15%, I'd say the same thing. If anyone asked, that is. I can remember in 1992 when Bill Clinton was elected president, all of the talking heads were talking about how pricey the stockmarket was. P/E ratios was near its highest levels in history. 1992 to 1999 was one of the strongest bull markets with multiple years of 20% annualized returns. There were some investors that stayed in cash, but in 1999 they couldn't stand it anymore and they got in, because it was the new economy and things are now different. We all know how that story ended for these people. Better to systematically invest, don't time the market, and ignore the financial news. When opinions like this pop up, it's worth noting whether the famous individual in question has a background in the subject matter. As far as I can tell, Jamie Dimon has no background in fixed income. Given that, I would not worry about his thoughts on the matter. Are these Morninstar growth charts before or after expenses? Growth charts, 1-3-5-10 performance numbers, virtually everything you see in mutual fund literature and just about anywhere is after expenses. That is, they represent the number of dollars you really would received if you redeemed the fund. I literally checked this once, in a brokerage account where I hadn't bought or sold anything in a while. (I'm sure this is because of some SEC regulation.) What you see is what you get.